She's been keeping busy as she commands the industry's leading shows in the Big Apple. 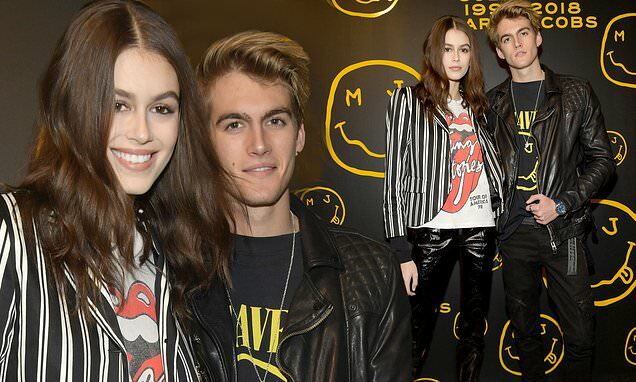 But Kaia Gerber enjoyed some time off her work schedule as she attended the The Marc Jacobs Redux Grunge Collection and the opening of Marc Jacobs Madison with her brother Presley in New York on Monday. The model, 17, earned her fashion stripes in a striking monochrome blazer, teamed with a pair of skinny leather trousers. Upping the style ante, the catwalk queen complemented her outfit with a Rolling Stones top and patent boots. She accentuated her striking features with light strokes of neutral-toned make-up, and wore her brunette tresses in loose waves. Meanwhile, brother Presley, 19, looked effortlessly cool in a biker leather jacket, ripped jeans and canvas trainers by Converse. On Sunday, Kaia walked alongside the biggest names in fashion, including Gigi Hadid, Irina Shayk and Hailey Baldwin.